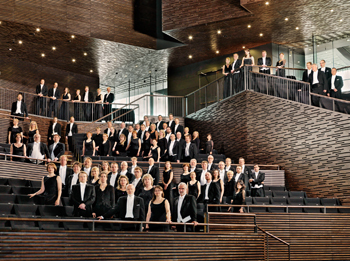 The Finnish Radio Symphony Orchestra (FRSO) is the orchestra of the Finnish Broadcasting Company (Yle). Its mission is to produce and promote Finnish musical culture. Its Chief Conductor as of autumn 2013 will be Hannu Lintu, following a season (2012/2013) as the orchestra's Principal Guest Conductor. The FRSO has two Honorary Conductors: Jukka-Pekka Saraste and Sakari Oramo. The Radio Orchestra of ten players founded in 1927 grew to symphony orchestra strength in the 1960s. Its previous Chief Conductors have been Toivo Haapanen, Nils-Eric Fougstedt, Paavo Berglund, Okko Kamu, Leif Segerstam, Jukka-Pekka Saraste and Sakari Oramo. The latest contemporary music is a major item in the repertoire of the FRSO, which each year premieres a number of Yle commissions. Another of the orchestra's tasks is to record all Finnish orchestral music for the Yle archive. The FRSO has recorded works by Eötvös, Nielsen, Hakola, Lindberg, Saariaho, Sallinen, Kaipainen, Kokkonen and others, and the debut disc of the opera Aslak Hetta by Armas Launis. Its discs have reaped some major distinctions, such as the BBC Music Magazine Award and the Académie Charles Cros Award. The disc of the Sibelius and Lindberg Violin Concertos (Sony BMG) with Lisa Batiashvili as the soloist received the MIDEM Classical Award in 2008, in which year the New York Times chose the other Lindberg disc as its Record of the Year. The FRSO regularly tours to all parts of the world. All the FRSO concerts both in Finland and abroad are broadcast, usually live, on Yle Radio 1. They can also be heard and watched with excellent live stream quality on the FRSO website.